LOUISVILLE, Ky. (CNS) — Nestled beside St. Agnes Church and School, the Carmelite Monastery blends into the brick facades that line a busy stretch of Newburg Road in Louisville. Carpooling families and dwellers of the Highlands area zip by at all hours rushing from one commitment to the next. In contrast, behind the monastery’s pale orange bricks, eight women religious — members of the Order of Discalced Carmelites — have only one commitment. They live a quiet, intense life of prayer in the tradition of St. Teresa of Avila, the 16th-century Spanish mystic and doctor of the church. On March 28, the nuns celebrated the 500th birthday of this saint who is credited with reforming the Carmelite Order and founding the branch of Discalced Carmelites, who include those living and working in Louisville. About four dozen people attended the liturgy, including members of the Secular Order Discalced Carmelite Community of the Holy Spirit (a local lay organization) and Archbishop Joseph E. Kurtz of Louisville. During the liturgy, the Carmelites worshipped from behind their full enclosure, or papal enclosure, as it is called. The nuns are permitted to leave the cloister only under special circumstances and with the proper permission. 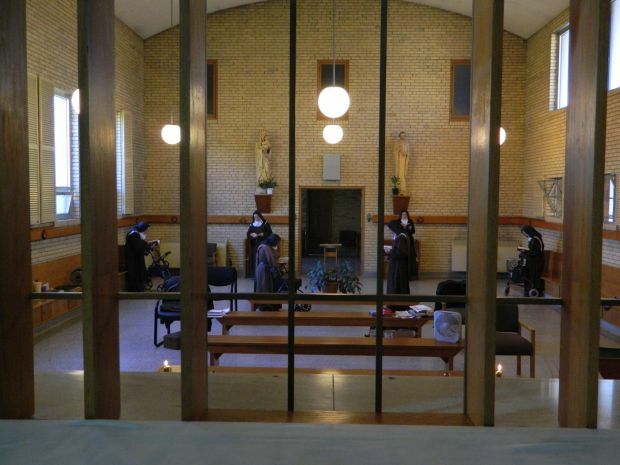 At the Louisville monastery, what in most churches is the rear wall of the sanctuary serves as a divider for the sisters. They worship on the other side of that brick wall. The altar stands against the center of this wall and the celebrant faces the sisters — with his back to the rest of the congregation — during the liturgy of the Eucharist. Neutral-colored metal bars separate the altar from the nuns’ worship area. The Carmelites live within their enclosure to safeguard the silence and solitude that make their contemplative lives of prayer possible, said the prioress, Mother John Baptist of the Lamb of God. In the monastery’s reception and visiting areas, the sisters speak to visitors through “the turn” — a half-barrel shaped wooden divider that rotates and has a grid of tiny holes through which voices can carry. The nuns said their monastery’s restrictive appearance belies the utter freedom, warmth and simplicity they feel within their enclosure and its regimented life. “My hands and feet know where they need to be so my head and heart are free for God,” explained Sister Mary Teresa. Mother John, in a gentle, halting voice, said that St. Teresa of Avila, also known as St. Teresa of Jesus, envisioned a domestic life for Carmelites, one that had the same dynamics and atmosphere as family life. Life at the monastery revolves around prayer amid ordinary chores, she said. Throughout the day — spent almost entirely in silence — the nuns move between solitary prayer in their cells, prayer as a community and the work of the household. Their schedule, seclusion and all the trappings of the life are designed to allow prayer to flow freely throughout the day. While everything else is regimented, their individual prayer has no prescribed form. While the sisters spend most of their time in solitary prayer, deepening their “friendship with God,” two hours of the day are dedicated to silent or “mental” prayer in the chapel — as a community. The nuns also share each evening in recreation, a time when they may speak and interact. This time is important, Mother John said, because it releases any tensions that may have arisen in the day and helps the nuns bond. The nuns, however, don’t discuss their spirituality. That is something deeply personal, said Mother John. Work at the monastery is much like work in any home — but on a larger scale. The monastery was built for 21 sisters. They try to be self-sustaining. Caring for the needs of older sisters has become more and more a part of the life. Mother John and Sister Mary Teresa are the youngest sisters and they have reached the half century mark. While the community is supported by donations, the nuns also support themselves by distributing altar breads. Most of the parishes in the Archdiocese of Louisville receive their hosts from the nuns. They also distribute the unleavened bread to churches in other states and Bermuda. The monastery welcomes visitors to a daily 8 a.m. Mass. Visitors also are allowed to visit “the turn” from 9 a.m. to 5 p.m., where they can ask the sisters to pray for a special intention. Prayer requests also may be mailed to the Carmelite Monastery, 1740 Newburg Rd., Louisville, KY 40205.